The Tianzhou1 is a Chinese cargo resupply spacecraft. It is designed to dock with China’s Tiangong2, a space laboratory currently in orbit. Last October, astronauts spent a month on the Tiangong2. This is China’s longest manned space station. According to the state media the Tianzhou1 is an “important technological basis” for the production of the Chinese space station. Even though the Tianzhou1 did not carry any cargo, due to the space station being unmanned, it has a large capacity to do so. The Tianzhou1 is capable of carrying 6 tons of goods and two tons of fuel. It is also advanced in the fact that it can fly unmanned for up to three full months in space. In the course of the next few months other test runs will be made to test the full strength of it’s capabilities, along with attempts to transfer fuel. The capability of the Tianzhou1 being able to dock with the Tiangong2 is important and useful technology in space exploration. It is unlikely that the Tiangong2 will ever be manned again; however, this tested the technological ability to use a similar resupply system in the future. China, who’s space exploration falls behind both the US and Russia, has peaceful intentions in advancing their space exploration. The next step in China’s up and coming space program is the launching of the Tiangong3. 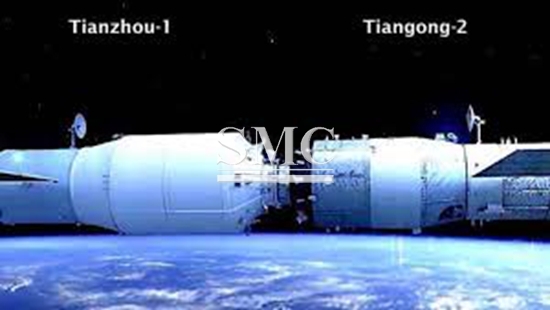 The Tiangong3’s main module is expected to launch on a Long March5 rocket sometime in the year 2018. The Tiangong3 will be fully launched and assembled in 2022. In totality the Tiangong3 will have 3 modules. The modules will have a main module with another module on each side, appearing to have a T shape. It is expected to weigh over 60 metric tons upon completion. It is expected to be in orbit for at least 10 years. The Tiangong3 will be equipped with several muli-purpose scientific facilities such as space life science and biotechnology, microgravity fluid physics and combustion, and material science in space. The space station can host a maximum of six astronauts at a time in rotation, however, it will normally only host 3. With the International space station retiring in 2024, The Tiangong3 is likely to be the only permanent space station in orbit. China’s plans to continue it’s space explorations and advancements over the course of the next several years.